The title of the first section, ‘Lightenings’, arrived by accident, when I found a dictionary entry that gives it to mean ‘a flaring of the spirit at the moment before death’. And there were also the attendant meanings of being unburdened and being illuminated, all of which fitted what was going on as the first poems got written (for example) the one about Thomas Hardy as a child on his back among a flock of sheep, gazing up at the heavens (DOD321). Lightenings vi and vii form a double-sided coin: vi portrays Hardy as a precocious boy thinking pondering his circumstances and causing confusion amongst a herd of sheep; vii sets the record straight before featuring Hardy as a very elderly man imagining himself already dead and causing mild embarrassment amongst those present at a reception. 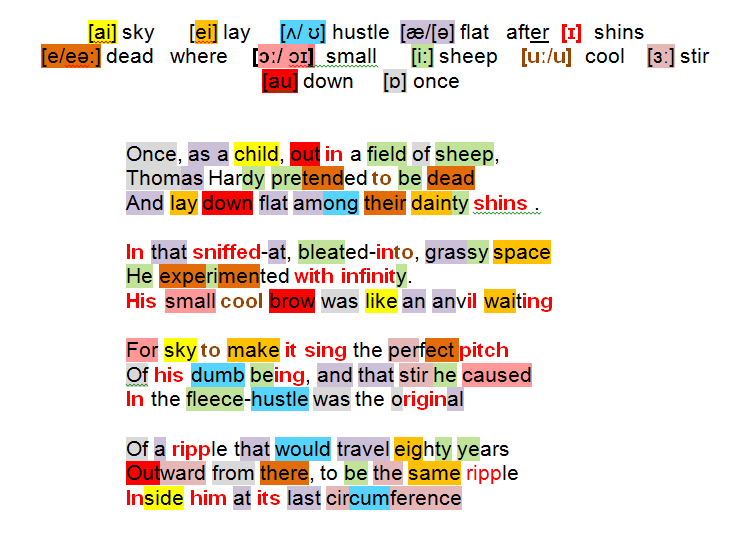 Heaney fabricates an anecdote involving English novelist and poet Thomas Hardy who, as a child, he alleges, feigned death out in a field of sheep. To Heaney’s fifty year old mind the precocious youngster experimented with infinity, tinkering with prolepsis, a figurative device by which death is presumed to have happened as, of course, it will one day. The boy selected an incongruous spot from which to stare up into the ‘airy structure’: on his back among the sheep’s dainty shins. Heaney’s eye-camera zooms in on the incident: a boy in a field heavy with earthy sense data (sniffed-at, bleated-into, grassy space), surrounded by flustered animals, unflustered himself (small cool brow), awaiting a signal from some higher plane (sky) that will strike perfect pitch on the anvil of the creative mind as yet undeveloped in his dumb being. Heaney appraises the emblematic significance of the incident: the commotion child-Hardy generated amongst the sheep (in the fleece-hustle) represented his initial impact on the world, – a small mass hitting water, creating a wave effect (ripple) that would reach tsunami proportions across his lifetime (travel eighty years/ Outward from there), still part of his being (inside him) on the day he departed this life: its last circumference. HV 137, (at the age of 50) the self-consciousness of writing and the presence of death cannot be evaded or over­ looked. It is for this reason that the landscapes and home­scapes of ‘Squarings’ are ‘airy’ rather than ‘laden’, static rather than dynamic, ‘distanced’ rather than proximate, made to resemble stills rather than moving pictures. Early in ‘Squarings’ Heaney recalls how Hardy, ‘at parties in renowned old age’, sometimes ‘imagined himself a ghost / And circulated with that new perspective’. The airiness of Seeing Things occurs because Heaney is contem­plating the physical through the scrim (obscuring veil) of extinction. That is the given of the book: what does the phenomenal world look like contemplated through eyes made intensely perceptive by unignorable annihilation?